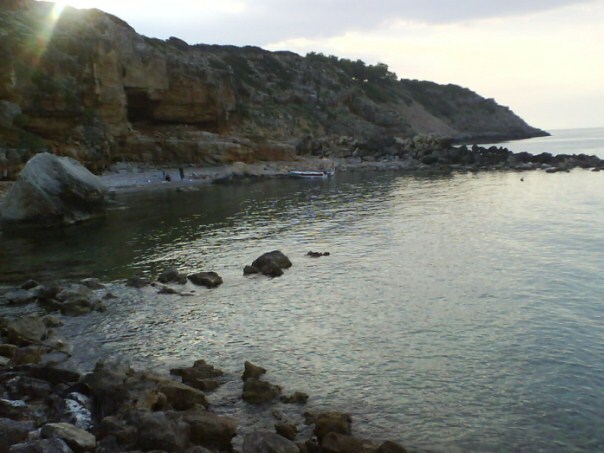 Gerani is a small beach, located 8km west of Rethymno town, near the homonymous village. This pebbly beach lies under the bridge of Gerani, at the exit of Vederi gorge, just off the new National road (E75) which connects Rethymnon and Chania. Few umbrellas and sunbeds, showers, tavern, accommodation. The quiet beach of Gerani with its rocky outcrops is ideal for snorkeling, though quite affected by the north winds. Whilst on the beach, one should visit the cave of Gerani, one of the most beautiful caves in the island. You can reach Gerani beach by frequent public buses from Rethymno and Chania. If you choose to drive, follow the new National Road (E75) connecting Rethymno and Chania, which runs parallel to the beach. Gerani cave is closed,covered by a rusty gate and locked and is obviously used now only asca toilet.. The beach is lovely and SANDY ! !